Hiking in Arches National Park takes you right into the middle of the largest concentration of natural stone arches in the world. In 1929, it was initially established as a National Monument. Congress made it a National Park on November 12, 1971. 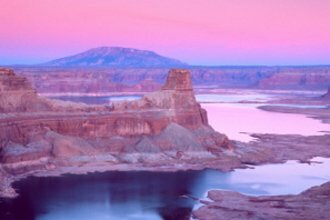 It’s an arid desert located just five miles north of Moab , Utah on Highway 191. 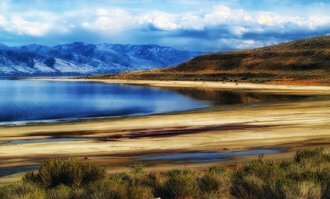 A 3½ - 4 hour drive from Salt Lake City. Be prepared for the variety of conditions you’re likely to face when you're planning on hiking in Arches National Park. .
From June through September, temperatures may exceed 100 degrees! On the other hand, from December through February, it can drop below freezing (32 degrees F). In a 24-hour period, temperatures can range 50 degrees F.! Always keep this in mind when planning a visit. 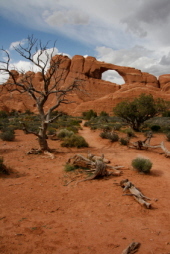 Hiking in Arches National Park can be enjoyable for even the most laid-back hiker. Much of the park can be seen from a car. 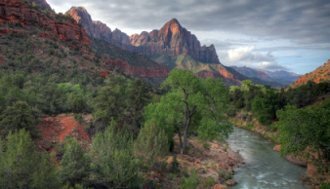 But to truly grasp its magnificent scale, try some of these hikes. Most of them are relatively easy and short. 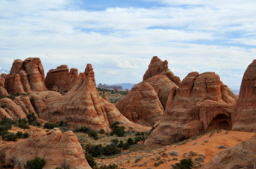 Hiking in Arches National Park is a wondrous experience for the lone explorer or for the whole family. As mentioned above, hiking trails lead to many of the features. 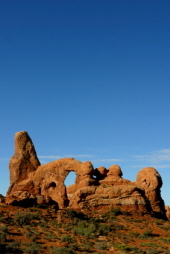 If you are physically able to, hiking in Arches National Park is the best way to enjoy the park. 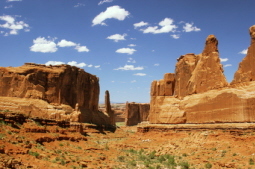 Below is a list of the Arches National Park Hiking Trails and a little bit about each. I’ve included photos for most of them. 1.) Balanced Rock - 0.3 miles/. 5km. 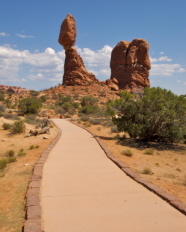 Balanced Rock is a great way to start your visit to Arches. It’s just inside the entrance. Although not much of a “hike”, it’s cool to look at and easily accessible from the parking lot or the nearby road. In fact, you can see the Balanced Rock from the parking lot. It’s even better close up. 2.) Broken Arch – 1.3 miles/2.1km. An easy hike through a flat sagebrush and juniper dotted grassland. The arch obviously got its name from the crack right down the center. It’s slowly eroding away from this point. It’s not broken. Just wearing a little. And it won’t break any time soon. If you move around a little, you can sit right under the massive Broken Arch. 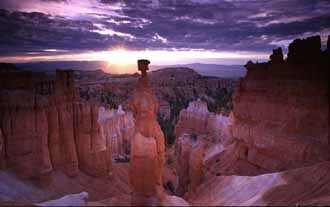 A great place to relax, watch sunsets, chill and enjoy hiking in Arches National Park. 3.) Broken Arch with Loop – 2 miles/3.3 km. 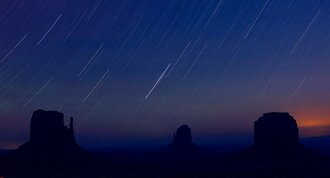 This loop includes both The Sand Dune Arch and the Broken Arch Trail. Its trailhead is along the main park road and near The Devil's Garden Campground. 4.) 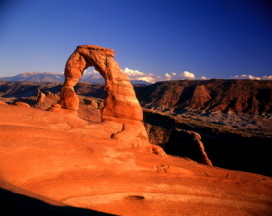 Delicate Arch - 3 miles/4.8 km. This hike to the most famous site in Arches National Park ... Delicate Arch ... is spectacular. The most awe-inspiring feature of the hike is that you can't see the arch itself during most of the hike. You see it just before you walk up to it. The closer to sunset you can make this hike, the more jaw-dropping it becomes. to take a lot of time sitting and taking it all in. Enjoying just being there. And marveling. The closer it gets to sunset, the better it gets. A photographer's dream. As the sun goes down, the light and the shadows dance all over the natural amphitheater playing tricks on your eyes. 5.) Desert Nature Trail - .2 miles/.3 km. This is a short self-guided nature hike explained in a brochure at the trailhead. 6.) Devil’s Garden Loop Trail – 5.0 miles/8.3 km. 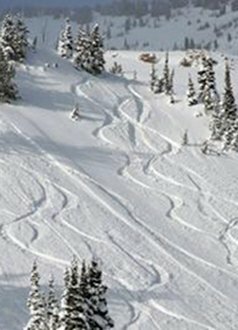 The longest series of maintained trails in the park. At least 60 arches in the area. A moderate 200-foot (62 m) gain in elevation. It takes you through narrow fins to the Landscape Arch and Double O Arch. (90 m) long and 188 feet (58 m) high. The trail to Landscape Arch is relatively easy but becomes steeper and rockier beyond this point. 7.) Double Arch - .5 miles/.8 km. Another easy trail. The short flat hike takes you through scattered junipers and oaks. arch in Arches National Park. 8.) Double O Arch – 4.2 miles/7 km. If you're looking for some strenuous hiking in Arches National Park, this is a good one. With rocky footing and numerous elevation changes. 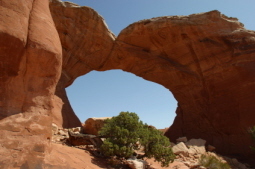 Double O Arch is the second largest arch within the Devils Garden area. spans 71 feet. The one below has a span of 21 feet. 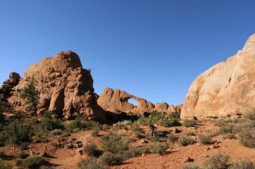 Double O Arch is located at the far end of the Devils Garden Primitive Loop. 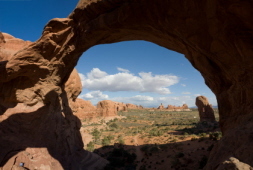 It is 1.93 miles past the Devil’s Garden trailhead and the parking lot at the north end of the Arches Entrance Road. 9.) 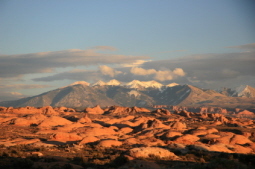 Fiery Furnace – 2.0 miles/3.3 km. Described above. The Fiery Furnace is a labyrinth of narrow sandstone canyons. Unless you or someone you’re with knows it well, sign up for the ranger-guided hike. relatively fit adults and older children. It’s a two-mile long loop. It’ll take about 2 1/2 to 3 hours to complete. The terrain occasionally requires you to use your hands and feet to scramble up and through narrow cracks and along ledges above drop-offs. 10.) Landscape Arch – 1.6 miles/2.6 km. Landscape Arch is the longest span in the world. 290 feet (90 m) long and 188 feet (58 m) high. It’s in the Devils Garden section of Arches. It was recently determined that it is definitely number one. Three feet longer than Kolob Arch, also in Utah. One of the great natural wonders of the world. As an arc natural arch, it’s thus considered near the end of its lifecycle. In its thinnest section, the arch is only 6 feet thick but it supports a span of rock 290 feet long! Unbelievable. This arch could disintegrate at any time. Tomorrow or centuries from now. For that reason, you can longer hike under it but a must see if you're hiking in Arches National Park. 11.) Park Avenue – 2.0 miles/3.3 km. 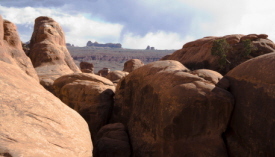 A moderately easy hike, the Park Avenue Trail is one of the first major stops in Arches National Park. It should only take about an hour for this hike. The trail descends quickly and steeply into a beautiful canyon right through the Park Avenue area to the Courthouse Towers. can see most of the major sights of Arches from the parking areas and pullouts. Nonetheless, it is much more enjoyable to be directly below these spectacular sandstone towers and arches. Enjoying the sites while hiking in Arches National Park is a great way to go. 12.) Primitive Loop – 2.2 miles/3.6 km. The primitive loop hike is a strenuous hike. It includes the hike through the Devil’s Garden area and continues up and around it through the backside of these large sandstone canyons. Although this whole trail is undeveloped, the north end between Double O Arch and Landscape Arch is considered the actual primitive section of the loop. Together with the rest of the Devil’s Garden loop, this trail is between seven and eight miles long depending on whom you listen to. Definitely one of the harder trails if you're looking to enjoy hiking in Arches National Park. 13.) Sand Dune Arch - .3 miles/. 5 km. An easy trail that leads through deep sand to an isolated arch among sandstone fins. One great big sandbox for kids! The trail up to Sand Dune Arch is a small slot canyon and becomes quite narrow. After the arch, it becomes too narrow to pass. 14.) Skyline Arch - .4 miles/.6 km. Skyline Arch is a popular stop for visitors. Another easy way to enjoy the sites and hiking in Arches National Park. It also offers great views of the rest of the park. How quickly can these rock formations change? In 1940, a large piece of rock fell from this arch and instantly doubled its size! 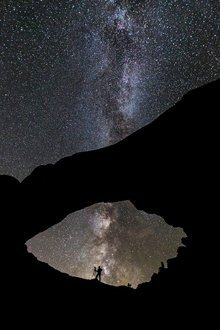 Skyline Arch is silhouetted against the skyline. Hence its name. 15.) Tower Arch – 3.4 miles/5.6 km. Tower Arch is a moderately difficult hike. The sign at the trailhead calls it a “primitive trail.” The trail immediately starts climbing up a short steep incline. 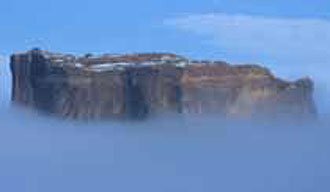 It then continues with changes in elevation until you see the immense Tower Arch surrounded by a maze of spectacular sandstone spires. Along the way you get great views of the austere Klondike Bluffs on your right. 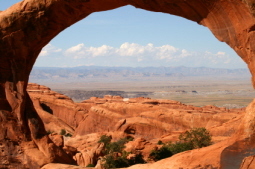 You can climb up under the arch and get a great view of the glittering often snow-capped La Sal Mountains. Tower Arch is a large arch in the remote northwest end of Arches National Park. Less than half a mile from the park border. The trail gains just over 100 feet in elevation but has a lot of ups and downs. You’ll climb more than what you might think when considering just the elevation change. 16.) The Windows - 1.0 mile/1.6 km. Named after two stone arches which, appropriately enough, look like windows to a magnificent view of other sections of the park. The larger one is named the North Window. The slightly smaller one is the South Window. look like a pair of eyeglasses. You can see what actually looks like a person’s nose sticking out from the middle of the glasses. There was a time you could walk through the North Window to get a fabulous view of the Turret Arch. Too much foot traffic forced the park service to restrict this area totally. It’s now off limits. If you happen to visit, please respect the signs. Just about everything of interest in this area can be seen either from the road or by taking short walks. 17.) 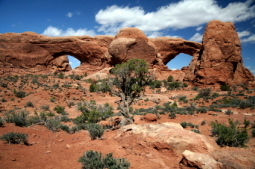 Turret Arch – .75 miles/1.2 km. Turret Arch is located in the Windows area. Beautiful views. Turret Arch itself is a unique freestanding arch. Follow the trail to the Windows. Take a right at the first intersection. Near the top of the ridge, leave the trail and walk towards the arch. You’ll get a great view of the North Window and beyond from here as well. As you can see, hiking in Arches National Park can provide a challenge for any hiker ... regardless of ability or fitness level. But it's more than that. Simply the best way to enjoy these unique magnificent sights.